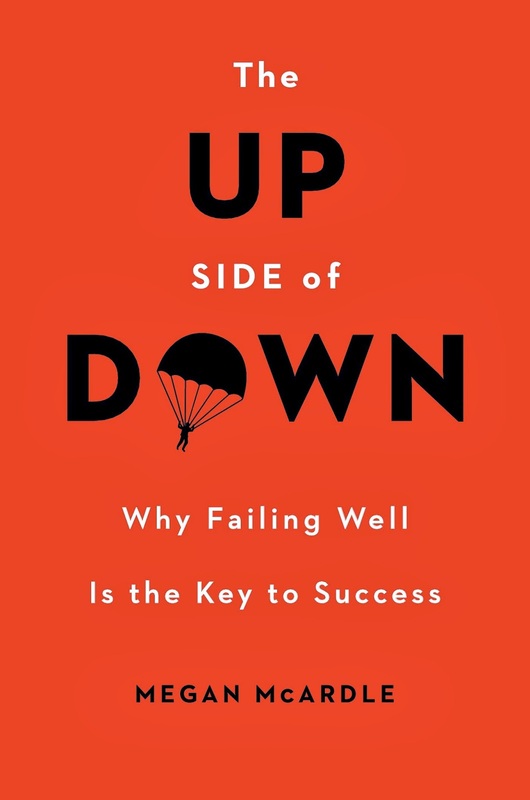 The Up Side of Down , by Megan McArdle was a title that I felt compelled to accept for review when it was offered to me. The subtitle, Why Failing Well is the Key to Success, was intriguing. I live in a world (oh, and so do you) in which being "successful" is a really big deal. It's such a big deal that it is frequently assumed unattainable for most. Because our definition is unattainable for so many, we tend to make heroes and celebrities out of those who are able to meet our definition of what it is. We define poorly to our own disadvantage as well as to the disadvantage of those who have attained "Hollywood status." How we Americans measure success (big house, fancy car, nice clothes, etc.) is more of a distraction than a boon. What I liked in reading the description of the book is that Megan McArdle has met with more failures than successes and thus I assumed (correctly) that her view of what success is was going to be different than what you normally hear described. She makes a moderate income, lives in a fixer-upper house (it was cheaper), doesn't buy new clothes every week and tries to live simply and debt-free. She has had a lot of failures and this book is an argument as to how it is that failing well help you to eventually succeed. She counts as proof of her success the ability to pen this book. I like that. McArdle points out that we tend to look down on those who fail at their efforts when we really ought to not do so. This is an argument I find appealing, in part because my own life is a series of failures if you look at the details of it. My personal experience is that I find people either fixate on my failures, assuming I'm less-than-they-are, or they assume that my life is perfect and I have the Midas touch (which is beyond ridiculous). The truth is, I have failed at several things I attempted in life. I have set goals for myself that took me eons to accomplish and some successes never quite materialized. The only smart thing I think I did in the midst of academic failure was to make a list of the things that God was teaching me in the middle of the challenge. (I still have the list I made and refer back to it whenever I'm facing a new challenge!) God was using those failures to teach me things about myself, Him, and the world. Failing, for awhile, was a way of life. And please note that up to this point I've only referred to academic failures and not relational ones. The relational failures were worse and more painful but they were (and are) still used for my benefit (and I firmly believe for the benefit of others). I believe that God doesn't waste anything in our lives and that all things are used for good for those who love Him (Romans 8:28). The Preface to this book made me want to stand up and cheer. "Most of us fear failure more than almost anything else. The number-one fear cited by most Americans, above even death and spiders, is public speaking. Which is, of course just the fear of failure in public. Failure feels bad to us, and worse when we think others can see it. Think about the last time you made a big mistake that a lot of people saw. You can already feel the hairs standing up on the back of your neck and the blush crawling up your ears, can't you? In this book, McArdle presents a wide variety of situations and examples to prove how failures works to teach the human brain how to process information, make different and more informed decisions and, ultimately, to make changes necessary to meet with success. Her argument is that how we handle failure is extremely important to our ability to succeed. It's very easy for humans to think poorly of those who are struggling to succeed. We wonder why they can't seem to get it together and do something productive. McArdle also includes arguments (specifically as relates to unemployment) that while it is easy to become discouraged we have to fail at things wisely, taking calculated risks and "sticking ourselves out there" as it were. As we try new and different things, our brain will be forced to problem solve. The brain will be forced to overcome obstacles which will contribute to our ability to learn through the fiery trials of this life. Being willing to keep working on a goal without giving up to either frustration or discouragement is definitely a challenge but, if you do this, McArdle suggests that success will happen. She would rather you think of moments of failure as teaching moments rather than reasons to give up. Her argument is not at all new; I think it is very biblical. God doesn't promise that whatever you put your hand to will be met with instant success. If you think that that is so, then you need to examine your Christian faith. Furthermore, your own mental abilities or physical strength is not enough to carry you through the day and, if you are a Christian and think either of those things is true, then you also need to examine your faith. I would take McArdle's arguments and build on them to suggest that you need to stop and examine where you've been and what you've learned and also pray for wisdom to make the best decisions and choices that you can when life looks confusing and you have problems to be solved. If you seek the Lord, He promises to be found (Jer. 29:13). This promise does not mean that just because you are seeking after Him that you won't occasionally fall down. The Bible teaches us that we have to "run the race" set before us (Heb. 12:1-2). Races are not won in one giant step (or perhaps two?). Races involve preparation, training, dedication and determination. In other words, races involve time and sweat and - very often - tears. Nothing that we do in our lives is ever wasted when our lives are committed to following Christ and we need never be ashamed of our failures. Hard times and hard falls have the greatest ability to transform our Christian walk. I have to tell you that I don't regret a single one of my academic or relationship failures. Neither do I boast in them (please, please do not misunderstand!). I do guilt and regret very well, thank you, but in the case of personal failures I really don't (which is probably curious). My failures were humbling experiences and I know that I will have more of them, so long as I am alive. (Hello, my name is Carrie. I am human and I make mistakes.) But just because I make mistakes (some more visible than others) does not mean that I am not a success in God's eyes if nowhere else because of what I choose to do with them. I think certain Christian types are very prone to think of mistakes and failures as nails in coffins. I could be very easily written off for some of my failures. But I refuse to accept any single mistake as a nail in the coffin because Jesus came to earth to die for my sins. He has won victory over death in every form and so I need not fear falling down. I will fall; He will lift me up. You will fall; He will lift you up. We must learn by falling, unfortunately, but the wounds received will be used for our benefit and for His glory. I chose to believe that with all of my being and that is why I don't do guilt or regret when it comes to my failures. It's why I don't think you should beat yourself up because you failed a few times either. Christ didn't win victory through death on the cross (perceived failure, anyone?!) so that I could wallow in misery over every mistake I make. By God's grace and because of His grace we keep pressing on. I'll point out that The Up Side of Down is not a Christian/religious title. McArdle makes her points with economic research, tales from academia, and examples from the business world. There is a lot of researched packed away into this book which might make you think this book is dry reading. However, she's building an argument in this book that I believe people need to hear and want to hear because failure is inescapable in this life and we know it. Instead of hiding our failures behind others (blaming) or by giving up (hiding out) we crave the encouragement she offers to keep on keeping on. Apply yourself to learning in the failures and you will succeed, even if the success you end up with isn't what you or anyone else anticipated. McArdle writes with wit and wisdom and I thoroughly enjoyed this title. Many thanks to Viking Press who sent a copy of this book in order to facilitate this review. I received no additional compensation and all opinions are my own. Furthermore, additional thanks to Viking Press for offering to give away one copy of The Up Side of Down to one of you! Care to win? Simply leave a comment below, including a valid e-mail address. This contest is open to U.S. Residents only and will be open through Monday, March 3rd. THIS CONTEST IS NOW CLOSED. THE WINNER, as selected by Random.org, IS #2 - BEKAHCUBED. CONGRATS! Ooh! I'd love the chance to read this! I need to learn to appreciate/learn from my failures more, so this sounds like a much needed read for me. Wow, what an interesting book! I can't wait to read it! This is a really good post, and sounds like a very helpful read.